I’m going to change tracks this afternoon, we’re going to ask Mika Lindroos to come up and talk with us. He’s going to talk us through the eConsent and how monitoring regulatory recruitment and retention, consent processes are transforming. So this is a relatively new topic, I’m sure, to many of you. I think Mika has lived, breathed, and slept this process and what this means over the last year or so. So please join me in welcoming Mika Lindroos. Right, thank you Alex, and good afternoon everybody. It’s lovely weather outside, so I hope this presentation makes up for the fact that you have to be inside. Yesterday in Finland when I left from Helsinki it was snowing, so it’s much much better out here. 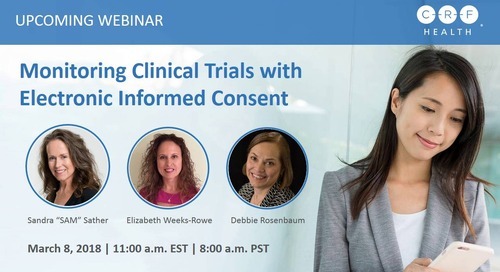 Okay, so I’m going to talk about eConsent and actually how that’s changing the processes of informed consent in many ways, and how it actually improves the patient centricity in clinical trials. Just to get some movement after the lunch, it would be nice to get a quick show of hands. 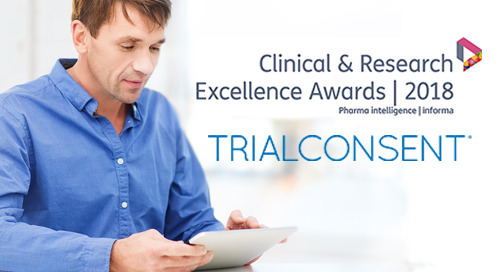 First of all, how many of you have been involved with a trial that includes eConsent implementation? Okay, a few. 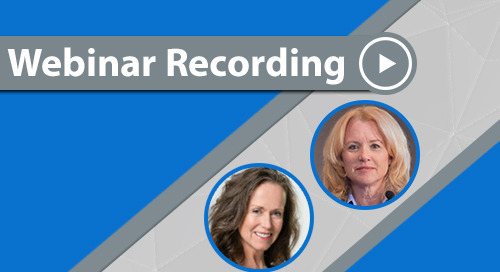 So how many of you know that in your organization an eConsent implementation has been done? A few more, okay. And who has heard about eConsent? Okay good. All right. Okay. So let’s go forward. So what is eConsent? 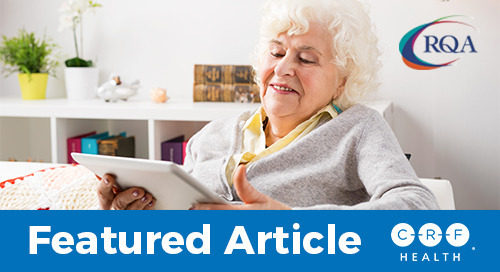 Basically what it means: bringing electronic implementation to the informed consent process. So that’s basically using different kinds of multimedia, video, graphics, audio, but also designing the content form so that they’re not just a kind of one long text document, but rather it’s more interactive, it has maybe some tiering, some optional content that you can read and study. It can have maybe some quizzes in between to test that the knowledge of the patient, you know, what they learned during the consenting process. But it also then provides more structure to the consenting flow that it follows the regulations. So that’s what eConsent is about, and I think it’s a next big step, or next big movement in the industry. 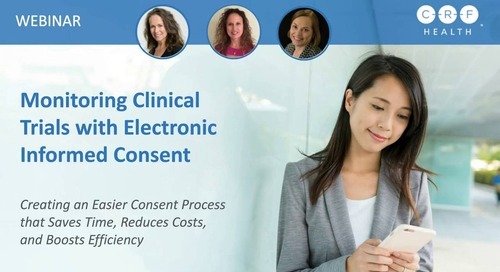 I mean at first we had the EDC, we had the eCOA, I think it’s quite natural that we are now moving to eConsent also in clinical trials and bringing the paper from informed consent into electronic format. So what are the things that actually—what are the benefits and what is the promise that eConsent holds? Quite interestingly, there’s actually a promise of having more and better data. So not only the kind of better consenting process but also affecting the data. And basically, you know, in very simple indications like pain or vaccines, about 1% or 2% of studies—and you know up to 8% and 10% of studies in more complex, like oncology, areas, or biologics—find that the data is actually lost because of the consenting process didn’t go right. Something went wrong, you know. Maybe a signature was missing or you know, the time stamps don’t match. Or maybe some screening procedures took place before consenting was actually finished. And quite typically these problems are actually found, due to the paper nature of things, quite late in the study. And then you know if already the patient is gone, you’ve lost the data, you need to recruit new patients to collect more data. Or then of course you could have also potentially recorded too much patients and then extending the length of the study. So this is one area where actually the better consent process also improves the actual data collection piece of the clinical trial. Then maybe a more obvious kind of point of view is the improved recruitment and retention. 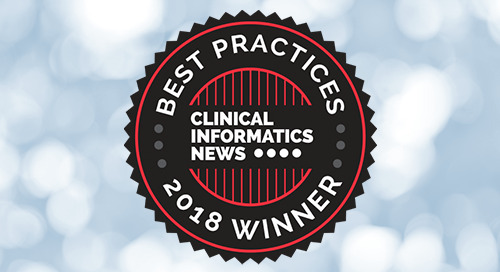 So, like discussed, bringing in multimedia, bringing in interactive content glossaries, all those contribute actually to improved patient and participant understanding, so they are much more aware of what is actually the clinical trial, what’s the purpose of the trial, what are the procedures in this trial, what are the potential side effects. They’re much more aware of those things and therefore they are also more capable of doing a consistent decision about joining the study, and this improves actually the recruitment and then also retention during the study. And in addition to the ethical considerations, we did a survey with sites, and 60% of them believed that the eConsent will actually help them recruiting patients to the study. So there’s the clear economical benefit as well. 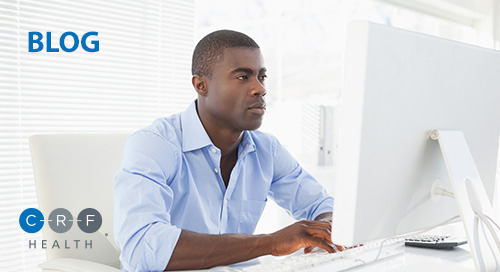 The other benefits of eConsent is actually improved monitoring. So if you think about paper consenting versus eConsent, so based on interviews that we did with some CRAs in the industry, they claimed about 20% of the consent documents have some sort of issue, you know, something that they actually, if typically they spend 10 minutes, maybe 15 minutes, going through the consent form, checking that it’s okay, 20% of those documents have an issue. And if they need to start looking into it, what’s the problem, finding the site personnel trying to find out what has happened, that can take anything from half an hour to two hours of the work of the monitoring, of the person who is actually doing the monitoring, and then of course it’s throwing off the site resources as well. So with the eConsent, because we are able to basically make sure that the whole consenting process is going through according to how it’s planned, we can time stamp all the signatures and we create a journal or audit trail of everything that happens during the consenting process. There’s much less problems. I’m not saying that there’s zero problems, there can be problems. But it’s much less, and this is reducing significantly the time that the monitors are using to solve what went wrong during the consenting process. And as a fourth thing, there’s a new type of clinical trials. Today people need to come on site, they sign the consent documents. 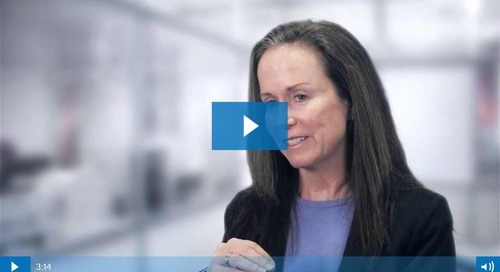 With eConsent, that can actually be done remotely, and that also gives access to a wider patient population who might not be able to for some reason or another to travel to the site. So these are just a few examples of where eConsent actually can help and improve over the paper process. So where are we? 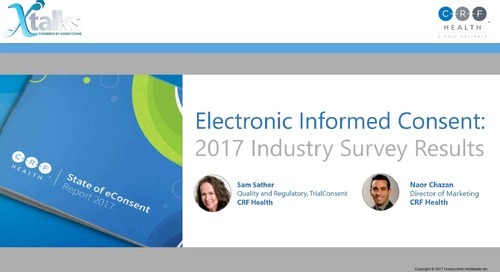 We ran a survey with 140-150 companies in this field, pharmaceuticals, CROs, IRBs, and asked, are you implementing eConsent, where are you. 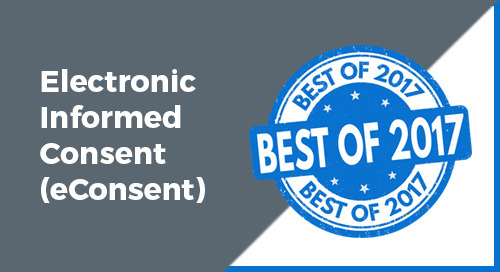 About a half of the respondents said that they are not yet using eConsent. But actually almost one-third of them said that they actually had used, in a number of studies already, eConsent. So we’re clearly seeing that there’s already some adoption on this area happening. And how it’s moving forward. So there’s a timeline, so basically the below is within a year and then up. The next three years from now, and then if you look from the righthand side to left, the kind of darker blue bars indicate the adoption levels. And this is what people believe how eConsent will be adopted. So within the next 12 months, around one-third believes that they will have eConsent implemented. But then if you look three years from now, there’s only 8% think that they will not eConsent at all. So there’s a kind of clear feeling on the market that actually eConsent will come and will be implemented in the studies. There’s a small print here, just kind of one fact about how we noted the difference between when you look at the people who are more into the sourcing and the business side of things and then the operational side of things. The operational side, people tend to feel a bit more maybe realistic in the adoption. But nevertheless there’s a kind of clear view that this will happen. And what is it that is then holding us back? What is holding the industry back? 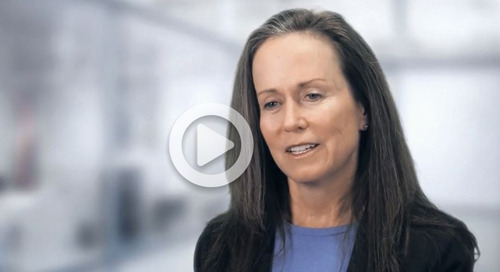 Why only a third of the companies have implemented eConsent so far? And these are again results from the survey we did. So the primary concern seems to be money, cost, budget, and we all know paper is free, right? So you know, it doesn’t cost anything to solve the problems or print the papers, or store them. So what we still need to do, we need to prove that there is a clear return on investment, that it is actually worthwhile to invest into eConsent and take it into use. So that’s one clear barrier. 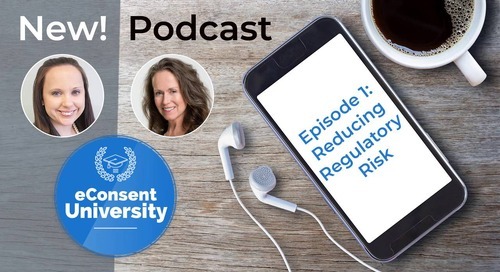 But then the second one is the regulatory concerns, you know, what are regulators saying, how the ethical committees and the IRBs, what they think about the eConsent and storing the data and all that type of things. So that’s clearly, I would say, a fear out there, how to deal with the regulatory aspect of things. And then other things like technological issues, maybe some confusion, not sure if the global acceptance is there, so you know, what if we do eConsent here, if we do it in the US can we do it in China, you know, or how it goes. And then maybe some privacy concerns. But that’s where, kind of, what is holding us back. And actually the good thing is that when we think about the regulators, so they are actually very much for eConsent. A good example: the FDA. They introduced their draft guidance on eConsent already in 2015, and now their final guidance last year. 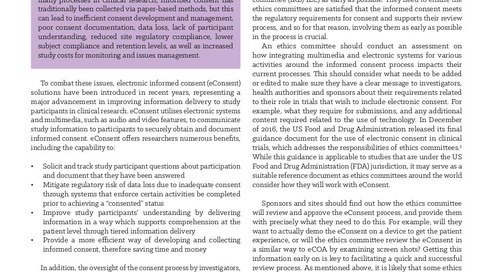 So basically FDA is kind of heavily driving eConsent, they are saying that you should take eConsent into use. Especially they are emphasizing the patient perspective. They are saying that, today, the paper consent is very much focused on capturing the signature on the paper. The documents have turned into more like a legal text, lengthy legal documents that you need to read through and just sign on the paper. And what FDA emphasizes is really the patient perspective, supporting the patient during the consenting, but also after the consenting, so during the whole trial. The consent document should be something that supports them, provides them information during the trial. There’s also other movement on the market. So CTTI and TransCelerate are driving eConsent, so CTTI has their own recommendations on how to design eConsent, what’s a good kind of structure of an eConsent document, how should you approach tiered information and so forth. And also TransCelerate has been working on a guidance document on what to take into account when you are selecting an eConsent vendor and what to take into account when you’re planning an eConsent implementation and how it should look like and so forth. There is already a kind of draft version of that out there that we’ve been reviewing as well, so I expect it to be out soon. But if you are considering eConsent then it’s worth it to look into what these guys are saying about implementing eConsent. Let’s then touch a little bit about the concerns of ethical committees and the IRBs. So we’ve been discussing with quite many of them as well and trying to find out, you know, what’s their approach to eConsent. And the typical answer, they say that, well actually we are okay, I mean you know, we are not against eConsent, there are just certain things that we would like to understand first. And they are, how do you protect the data, because unlike in eCOA, in informed consent we actually capture the person’s name, their signature, and that’s PSI data. And you know, today it’s stored on paper at the site. How do you protect that one? So that’s one key consideration they have. And it’s important that you have a solution where the PSI data is encrypted, where it’s completely separated from all the other data, where the access rights are managed in such a way that only the site personnel can grant and have access to that part of the data that is captured, and so forth. And then of course, when you’re dealing with electronic systems, you need to have all the network and software security and layers of different kinds of protection and firewalls in place in order to say that the data is safe. I mean it’s not the only place where PSI data is stored in the scope of clinical trials, so from that perspective, it can be protected. Then the other question we quite often run into is, how actually is, when you are moving the data across borders, especially the PSI data. And this is more, I would say, a kind of belief that there is a problem than what is the actual problem. So we’ve been looking into the regulations country by country, especially for example in Europe and the US, there is actually no problem of transferring the data. Some countries require that you just register that you are transferring data across the borders. But there is no major blocking point there. One example is Russia. Russia has a clear definition that you can’t take the data out of Russia and then the way you deal with it is that you need to have a cloud environment, basically, set up in Russia so that the data can stay there. So that’s a kind of example of where this can be an issue, but typically not an issue. The other thing is signatures. How do you capture them, and how do you prove that they are right. So e-signatures, as we have been using the password, those can be used to capture signatures. But most typically the signature is actually captured on the handheld device, so there’s a stylus, you write your name, I guess we all have experience of that one. And when you have a proper implementation, I mean I guess most of us have received a package and written the name on that one, and the signature can be quite messy. But that’s also kind of related to the performance of the equipment that you are using, so if you have a proper device which is very sensitive it can capture the kind of pressure and the speed you’re writing, then those can be actually used to collect the biometric evidence about the signature. And then is the adoption of the process. So understanding how does actually the approval, when you do the IRB submission, what you need to include in the package. Do they give their approval using the eConsent, or do they give it on paper, do they need screens, that type of thing. So that’s more like taking the processes into use. So all of these areas can be overcome, but it’s good to know that if you are engaged with the discussion, these are the typical questions you will run into when talking with the ethical committees. So we discussed about what are the benefits, what is the adoption, and what are the barriers. And then let’s look at how do we actually facilitate the eConsent. So from the patient perspective—and this again results from the site survey—typically the questions people have after the consenting—and this is paper consent—is, first of all, what are the treatments and what are the side effects. And then what are the study procedures. And then actually it was found out that about 5% of people, after consenting, they actually don’t still know what’s the purpose of the study. So with eConsent, using tiered information, multimedia, glossary items, knowledge checks, we can facilitate that learning, we can improve it. But of course a lot is also dependent on the contents so that it’s designed so that it better meets the learning. We like to say that we think about the adult learning theory, so you know, taking into account how you learn using audio, using video, through reading and kind of combining different methods. And of course, I think in the PRO world, we are testing content validity, maybe we should do that also in the eConsent world. Those of you who have actually been involved with paper consent and development of paper consent, there’s a process on the righthand side, a very simplified process. So you’re very familiar with that one. And the point I want to make here is that when you are creating a consent document, you actually start with one global document, you have the protocol and then you write the global master document for the consent. But then you actually need to roll it out to countries, and different countries have different placement, typically all of countries will have a little bit modified version of the consent document. And then, those countries will then translate that consent document, once it’s agreed, to the languages that are used in that country. So I guess here in Switzerland it would be translated at least to four or more languages, right? But it doesn’t stop there. So then actually when the translated document is sent to site, then sites and the IRBs or ethical committees really decide they have some specific requirements also that need to be changed on the document. And this of course affects all the language versions, and you can understand that quite quickly the amount of documents that you need to manage explodes. And then when you have a protocol amendment, you need to do the consent form again, and then you repeat the process all over, and you know, this leads to situations of using wrong documents and non-approved documents and things like that. And then you should develop the eConsent on top, so you know, how are you going to manage all of that. And the important thing is that if you are taking eConsent into use, you also think about solutions where you actually avoid duplicating the whole process. So you take into tools that actually facilitate the development of the consent process, so using electronic tools, making sure that all of this version control and all of the different site versions and language versions, they stay nicely organized. Also the amendments stay nicely organized. And then at the same time, when you’re developing the paper consent, you’re actually developing the eConsent or vice versa. So it’s important to take into account that when you’re doing eConsent you find the tools that actually facilitate your process and don’t create more problems for you. And then lastly, the site perspective. So looking at the graph below, sites themselves actually believe—the majority of the sites believe that eConsent would actually be helpful for them. It sounds useful. So then thinking about the site perspective, so you know, how do you adapt the local processes, how do you provide that you have enough training for them, and also that the usability of the systems is such that it’s easy to use and also easy from the patient perspective. So instead of creating additional burden we’re helping the site people. 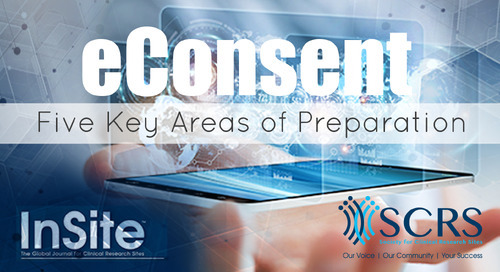 And with eConsent they don’t for example need to keep so many notes about what happened during the consenting session because the eConsent tool actually can create the audit trail and capture most of the data during the process. So I’d like to stop where I started, so just a show of hands. I think it somewhat resembled this. So there’s clearly a change going in the industry. So the top ten pharma, all of them have an eConsent initiative in place. The top 20 pharma, the majority of them have actually already implemented eConsent. You know, we had a nice discussion in the morning about who jumps first, like everybody’s looking at who jumps first off the cliff. And the good news is that actually quite a few people have actually jumped already. So you know, there is experience out on the market and the eConsent is moving forward. And if we then look at the top 50 pharma, so also two-thirds are engaged in one way or another or planning to engage in the very near future to the eConsent. All right, so that’s it. Thank you. Mika, thank you very much for that. I enjoyed that, actually I hadn’t realized that the perception and the acceptance of idea of eConsent was so broad with Mika’s last slide with so many pharmaceutical companies beginning to run an initiative in this type of technology use. I also hadn’t realized that the sites were so up for it. So that’s certainly something that I took out of Mika’s presentation. I’d like to invite anybody from the audience that might have any questions. It might just be my ignorance, but in terms of when you record consent, is it done on a handheld, is it done on a slate, is it on the internet? So what different ways you can record on. I’m just saying that, for example, if you have a study that doesn’t have any eCOA or ePRO, do you specifically have to have a handheld just to record consent, or can it be done other ways? Right, yeah that’s a good question, how do you actually capture the consent. And if you work with CRF Health, we provide all of those options that you mentioned, so you can use other existing equipment at the site. If you have an eCOA study together with the eConsent you can use the same devices. Or then you know, specific devices can be provisioned for that purpose. So all those options are possible. The typical way is that you have a tablet device where you actually do the consenting session. There are actually other implementations out there. For example in India, they are video recording all of the consenting sessions, it’s quite a different approach, and you can imagine the monitoring nightmare it creates, but yeah. So typically a table device, either provisioned for that purpose or for using the same device for eCOA and eConsent. I see you mentioned it’s a way to reach more patients and they don’t have to move to the site to sign it. Are regulators happy with that, that the patient is not signing the consent with the PI or a study co or someone who has explained it in detail? How does it work, this aspect of it? Yeah, so in the remote consent scenario, it’s still important to have that question and answer session, that kind of review of any questions that they might have with the site personnel. So then that needs to be done over telephone or then using a video conferencing or something similar. So typically if site is involved, then you need to have some sort of communication during the consenting session. There is however and example of a study we are currently running where basically there is no site involved and then basically the patients are doing self-registration themselves, they’re doing the consent themselves, and then they move into completing the diary and everything happens remotely, so it’s a complete virtual study in that perspective. 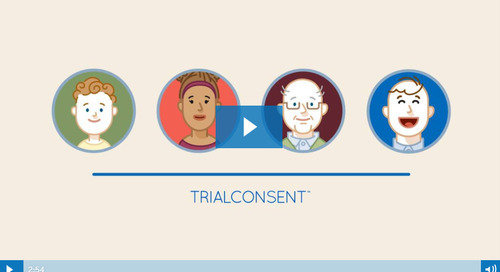 In such a virtual study, how do you prove that the patient that is giving consent is actually the patient that is participating in the trial? Yeah, that’s a valid point. So I think in this particular virtual trial, identifiable information is collected when they register, because it’s more like a marketing study, this one. So it’s not so wide. But then yeah, the question, in a clinical trial how do you prove that the person is who they are. So then there’s a few ways of course. It’s possible to use external identification services, where people have already—like banks or insurance companies—where they already authenticate earlier and use their services to identify the person. You could also take a photo of their ID, and of course if it’s a video conferencing session, you can also confirm their identity there. But you’re right, it’s not a gapless thing at the moment. Do you have any experience or knowledge of feedback from the health authorities at the FDA or EMA or whatever authorities concerning this eConsent, either through submissions or findings from inspections? No, we don’t have any specific feedback from those authorities at this point of time. Like discussed in the presentation, FDA is very much actually trying to drive the adoption of the eConsent, so they are all for it. But when it comes to findings, unfortunately I don’t have any of those experiences. Actually, looking at signing the informed consent is the one part, but what of then end? How is the outgoing process? How do you share that data later on with the site and how do they get finally the information and archiving these informed consents form at the end of the trial? Yeah that’s again a good question. So basically, first of all, when the consenting session is over, and the patient has signed and then the site personnel has signed the documents, it’s immediately made available in the database so that a monitor can for example log in and see the consenting. I mean first of all, the audit trail, how did it go, which pages they spent, how long a time they spent and how did they answer the questions and if they flagged any of the items during the process where they had questions, and what questions they had and so forth. So all of that information is available. And then there’s the signed document available. And when the study is over and archiving happens, so then we basically take that audit trail, we take that document, we package it, and we export it as an archive, and store it. So that’s then made available also after the study is finished. Which format, I would have to check the actual format of the archive, can’t answer you right now. Because you need to make it available for the sites, and they need to store it finally. And they need to be able to look at it and open—if you send it by CD, you need to make sure that they can read it within the next ten years at least. So it must be a kind of PDF or some format with a respective reader on the form, some guidance. The other thing is that we are facing the questions from authorities that we need to track that we have provided information to the sites. Who is taking care about the tracking? Did you capture, or do you capture a confirmation of receipt from the sites that they have received the archiving CD, that they’ve proven readability and that they are fine with that? I know it’s operational questions. That’s finally where we struggle because at the sponsor side we do not get that information at all. So even if the trial is done in an ePRO study, we could provide a copy to the investigator because we have parts of the site archiving file or at least all the PDFs of the diary data. But for these informed consents we will never be able to ensure that a site and we cannot track that the site really has received everything that they need to have. So this part is completely, from a sponsor perspective, out of our control. No, that’s a fair point, and a good question. I would have need to kind of revert back to my operational colleagues about how actually it is, on that level of actions, how it’s done. But we can certainly take the question and come back to you on that one. Going back to the electronic signature, I have a question. So we worked on the pilot with the FDA and the EMA, and we got the okay from the FDA for the electronic signature, but EMA told us clearly that they do not accept electronic signature. So do you have any workaround for that? Yeah, that is a problematic question. If you look at Europe, in Europe there is an ADOs directive, it’s a legislation that actually provides a clear guidance on what forms of electronic signature you can capture and what levels of authentication, what levels of identification you need to provide, and that actually governs all the member countries. But of course the problem is that you might say that it’s not okay. Now the workaround you can always use is that you do the consenting, you make sure that the patient actually goes through the consenting session, they get that learning that is meant to get from the electronic experience. But then you sign on paper and then at that step do the electronic file. So that’s a workaround. But I suspect that’s also a cultural thing that will take a little bit of time and hopefully change towards the better over time. Thanks, just a quick question about timing. So with eCOA and ePRO, it takes longer to set things up than it does on paper because you have to do all the screens and so forth. With the eConsent, is it a similar kind of thing where it takes longer? And if so, how much longer roughly, just so we know for setup timelines and even when you have protocol amendments, if you have to change the consent, is that a fairly quick process to do? Yeah, that’s a valid question. And basically we interviewed and have been interviewing quite a many people in the industry who actually develop consent forms and paper and it seems that typically the paper consent development process is something that we do in three months. And then the typical market value for also developing eConsent is another two and three months. However, what we are doing at CRF Health, we are providing a tool where you actually can develop and deploy both paper and electronic consent on the same tool, and there we are able to meet the same timelines as we’ve done with the paper all together for both implementations. Any other questions at all for Mika? Mika, thank you very much for that, that was a really terrific presentation. Thank you. 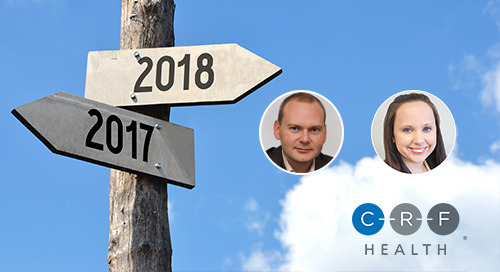 Mika and Jackie discuss the progression of eConsent in 2017 and predict where the industry is headed in 2018.